There have been some big trades this offseason, but the one Friday between the Los Angeles Dodgers and Cincinnati Reds may be the biggest one yet. As part of the trade, the Reds have acquired outfielders Yasiel Puig and Matt Kemp, starting pitcher Alex Wood, and catcher Kyle Farmer. All four players will be free agents after the 2019 season. In exchange, the Dodgers will receive Homer Bailey, pitching prospect Josiah Gray and infield prospect Jeter Downs. 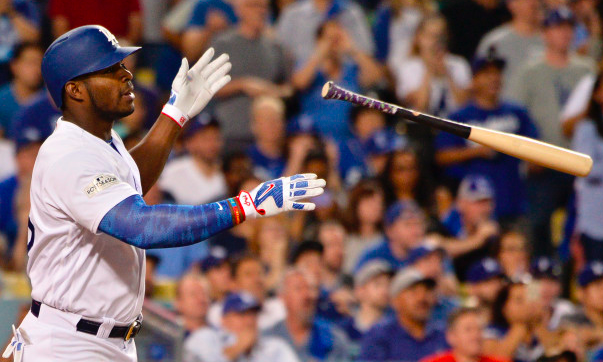 Puig, of course, is the highlight of the trade. He has displayed almost limitless potential during his time in Los Angeles. But he’s also had issues with immaturity and inconsistency. For what it’s worth, he’s started to settle in the past couple of seasons, hitting .267 with an OPS of .820 this past season. He’s also 28 and very much in his prime. Kemp should not be overlooked either. The 34-year old hit .290 with an OPS of .818 in 2018. He can still hit, even if it’s in a part-time role. Puig and Kemp join what is now a somewhat crowded Cincinnati with budding stars like Jesse Winker and Scott Schebler, both left-handed hitters. How playing time shakes out with those four will be interesting, although the Reds certainly have options. Cincinnati is also adding a Wood, a reliable starter, to their rotation. The 27-year old has posted a sub-4 ERA in all six of his big league seasons. He’s very much in his prime and could be looked at as Cincinnati’s ace next season alongside Anthony DeSclafani and a slew of promising but unproven pitchers. For the Dodgers, this trade was more about subtracting than adding. Bailey is expected to be released after the injury-prone starter had a disastrous 2018 campaign. The Dodgers have more than enough rotation depth as it is, which made Wood somewhat expendable. Meanwhile, both Gray and Downs are A-ball prospects who are a few years from the majors. Downs was Cincinnati’s no. 7 prospect, according to MLB.com, with Gray ranked at no. 20. More importantly, Los Angeles shed payroll and a lot of space in their outfield. As it stands, the Dodgers still have enough competent big leaguers to put together a solid outfield. However, losing Puig and Kemp created the money and roster space needed to make a serious push to sign free agent Bryce Harper. In fact, this trade could signal that the Dodgers feel they have a realistic shot to land Harper. Whether this trade works out or not for the Dodgers will depend on if they get Harper. However, given the depth on their roster, all four players traded were expendable to some extent, so it’s unlikely this trade will backfire later. As for the Reds, this trade dramatically improves the talent on their big league roster. This trade alone may not be enough to make them contenders in 2019. However, that is obviously the goal with all four players having just one more year of team control. If nothing else, this trade makes Cincinnati an interesting team to follow the rest of the winter to see if they can make any more moves that push their rebuilding project even further along.